A bill introduced in the 2017 Maryland General Assembly is aimed at helping tackle the growing Suburban Maryland office market vacancy rate, which was roughly 15% as of December 2016. Delegates Jeff Waldstreicher (D-20) and Charles Barkley (D-39) are sponsoring the measure, which would create a State Make Office Vacancies Extinct (MOVE) Program that would match any funds provided by local MOVE programs with State dollars provided through the Maryland Department of Commerce. 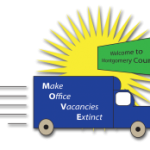 The Montgomery County MOVE Program is a part of the County’s Economic Development Fund and designed to attract businesses to lease Class A and B office space in the County. Through the MOVE Program, new or expanding businesses in the County may obtain financial incentives for leasing office space in the amount of $8.00 per sq. ft. up to 10,000 sq. ft. leased for a minimum of 3 years. The program has been hugely successful with over 26 companies having taken advantage of the program occupying over 100,000 sq. ft. of commercial space. Additionally, these companies have brought over 180 new jobs into the County. To qualify for the proposed State MOVE Program, a business must be located in a County that has a comparable program to reduce office vacancies and execute a lease for at least 3 years of up to 10,000 sq. ft. Additionally, to qualify, the business must be a start-up company occupying its first commercial space in the county, or a business relocating or significantly expanding its operations in the County. Restaurants and retail establishments would not be eligible for support under the program.